Today's topic may take you aback for a minute or two. 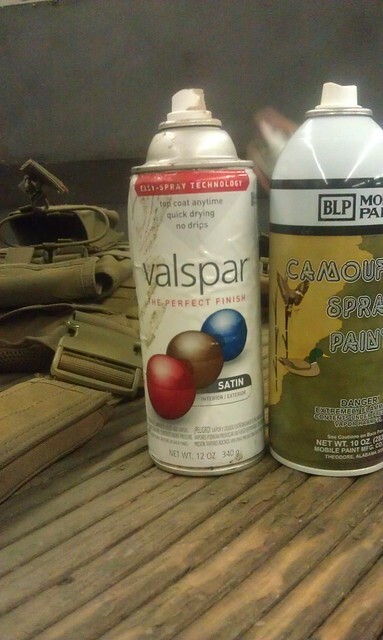 I'm going to talk about applying freakin' spray paint to tactical nylon gear. Why? Simple. Vanity. Let's face it. 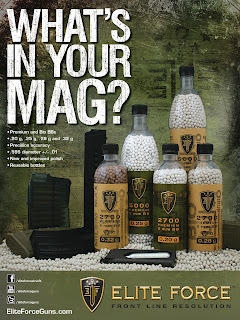 For the majority of us out there, Airsoft is all about looking good. Who cares if you call your hits, as long as you look good while cheating, you're totally legit, right? Wrong, of course, but before I get too far into sarcasm town, let's fall back and address the painted nylon. When the idea was first bestowed upon me by a good friend, I was appalled. PAINT YOUR KIT?1?! Sacrilege. 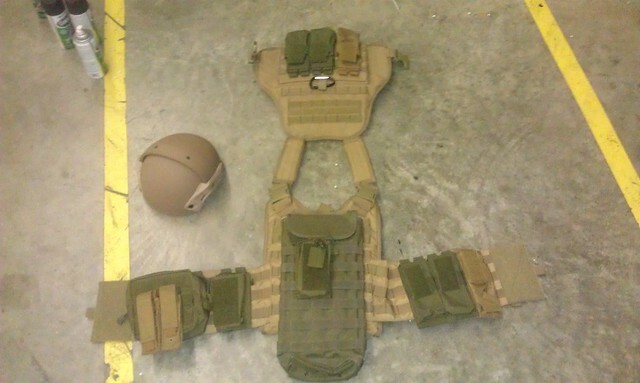 But then, once I saw how much better it made the gear look, I started to come around to the idea. 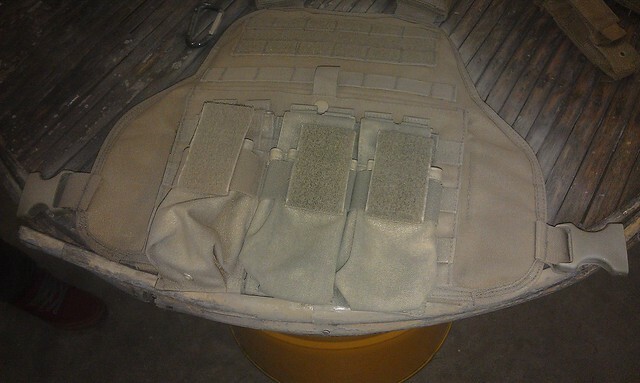 Then, last week, I picked up a new Condor plate carrier for a little last minute stealth mission, but didn't have any matching pouches to go with it. 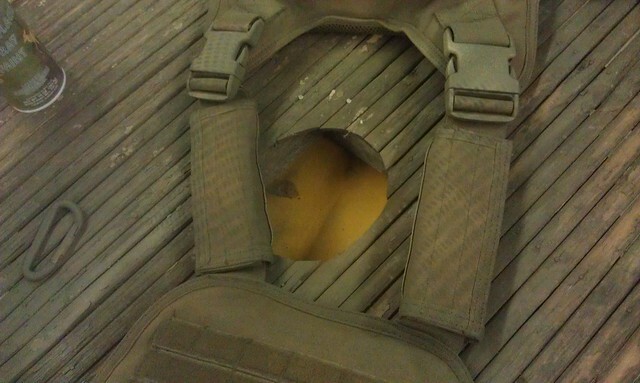 All I had were an assortment of 5.11 Viking Tactics (VTAC) pouches in OD Green or Coyote Tan, so as you can see below, my kit was looking less than stellar. 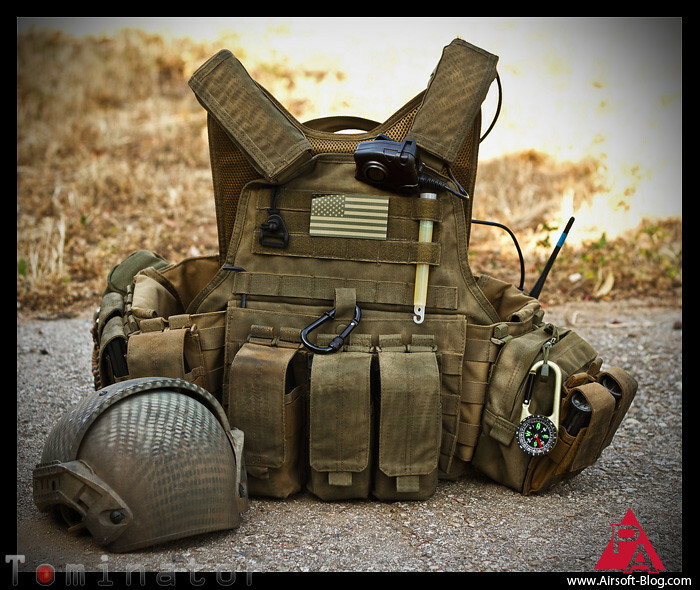 So I called up my buddy, Jon, over at Insight Interactive CQB Arena and said, "Time to get your 'Tactical Monet' on and paint my new kit." 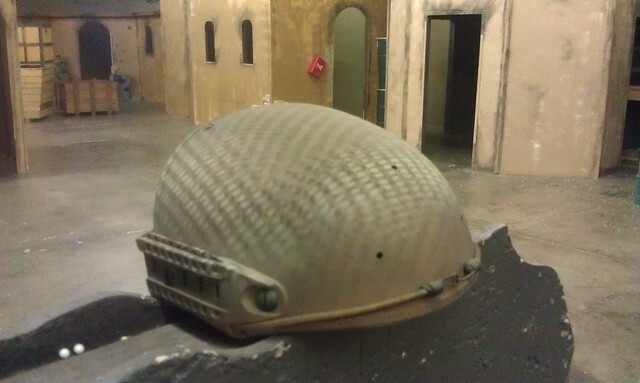 You'll also notice I've got one of those super sweet, super fake Crye Precision Air Frame knockoff helmets there, too. 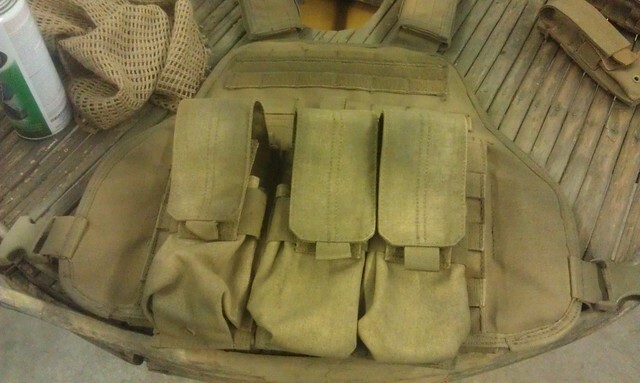 Mine finally arrived the same day I got my new vest, so then I said, "Well, heck. Gotta have consistency in my overall appearance." 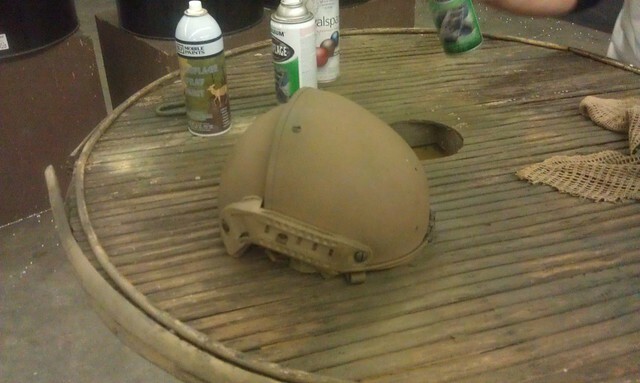 So the brand new helmet and brand new vest each went under the spray can. The story doesn't end here, though. I figured that if I was going to go through the trouble of this process, I would at least document it for you to check out at home (or likely, work) and perhaps inspire you to do the same to yours. I know that I said "my tutorial" above, but I'm really sort of just relaying the message from my buddy, Jon. He's the one who had to show me how to do it. 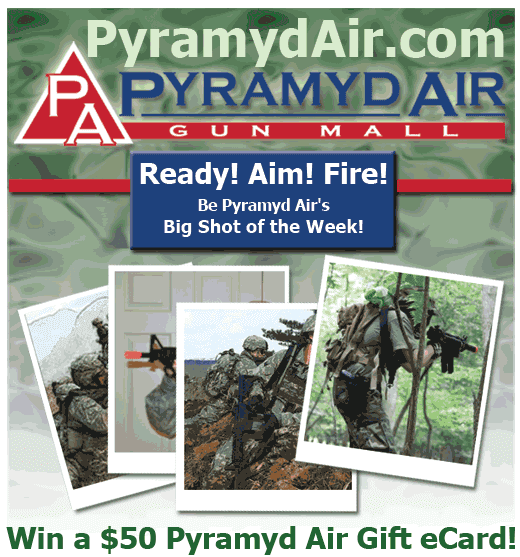 So let's talk first about supplies you will need for this mission to be deemed a success. - Spray paint, findable at Wally World (Wal-Mart). Camoflage Green, Flat Tan, Glossy Tan, Black. Nevermind what's going on in the background of this photo. It's not what you think. - Balls, especially big ones, if you're like me and decide to paint a brand new item. - If snakeskin camo is the way you want to go, you'll need some sort of mesh material, like a sniper's veil, as seen on the left. Before I go any further, I would like to apologize for those horrendous photos. I went to the trouble of transporting all my gear & supplies for this project, PLUS my camera bag, except when I pulled out my DSLR to start snapping photos, I realized that I had forgot my dagnabbin' CF memory card at home, so I had to roll with the cell phone camera for this one. Sorry, peeps. I slapped myself on your behalf for this one. Alright, so we started out by adding a flat tan base coat to make everything look fairly even, color-wise, as somewhat illustrated in the photo above. 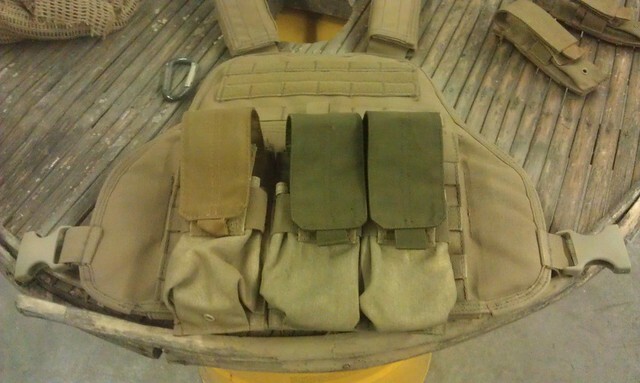 Below, remember to untuck your magazine pouch flaps (if that's how you roll), otherwise you'll have this little situation on your hands. Luckily, we caught this early on in the process and simply added a flat tan base coat to the flaps as well. 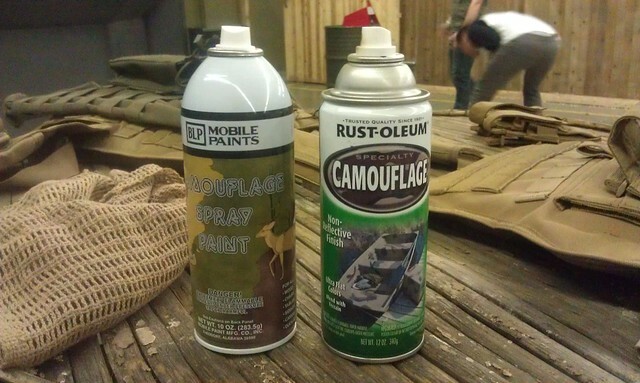 Once you've got your base coat squared away, then you can add in a bit of the camo green, using light, sweeping motions of your arm as you're applying the spray paint. Don't cover up the base coat completely with the 2nd color, you just want to add a bit of contrasting color, randomly over your gear. 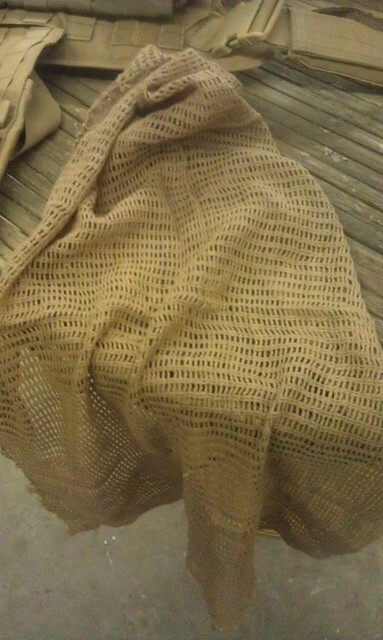 Now comes time for the snakeskin. 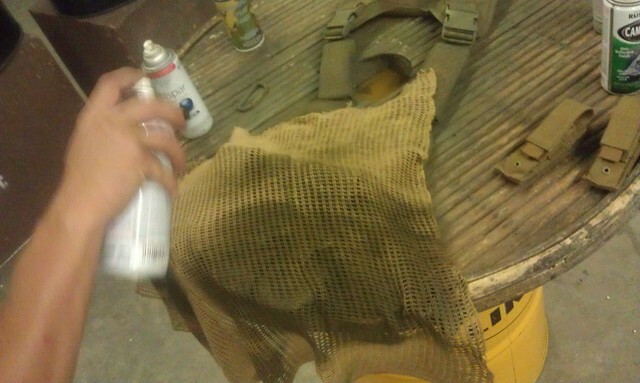 Place the mesh material, in this case a sniper's veil, over your gear and then lightly spray paint with either black or the glossy tan, again in sweeping motions. In some areas, use the black and others, use the glossy tan to mix it up. So just let that dry for a bit. Depending on the type and amount of paint you use, it shouldn't take long to dry. Technically, you don't have to do the snakeskin part. You can stop once you've applied your base coat and then mixed in some OD green, black and a bit of that glossy tan, without the mesh veil thing. 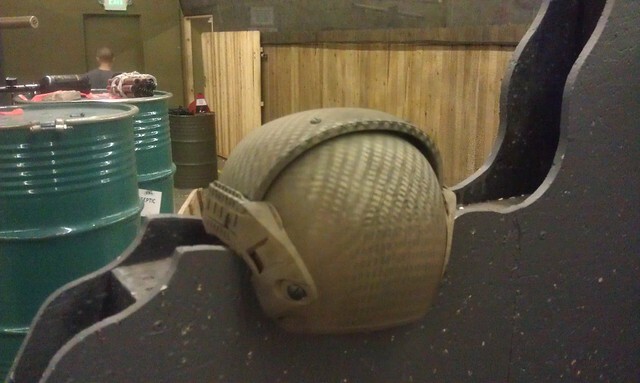 The result for that, before we added the snakeskin element, looked quite a bit like A-TACS camo. Now, I'm not saying it was as good as the real deal, but was still pretty attractive to look at. 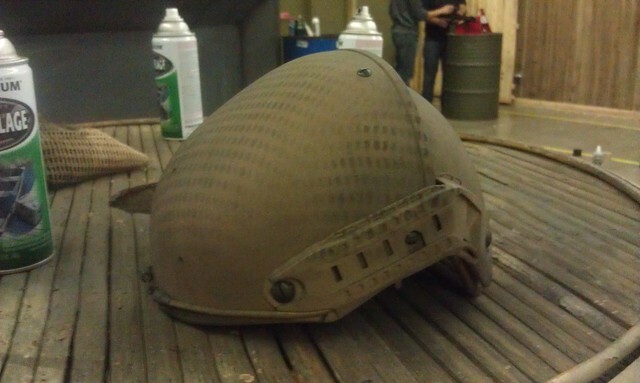 For the helmet, pretty much the same process. Base coat first, then secondary contrasting colors. Voila. Actually, not quite. But we're getting there. Just a side pic (and yes, I am working on picking up an NVG mount base, along with a few other helmet accessories to trick this thing out, so chillax, my gear whores. 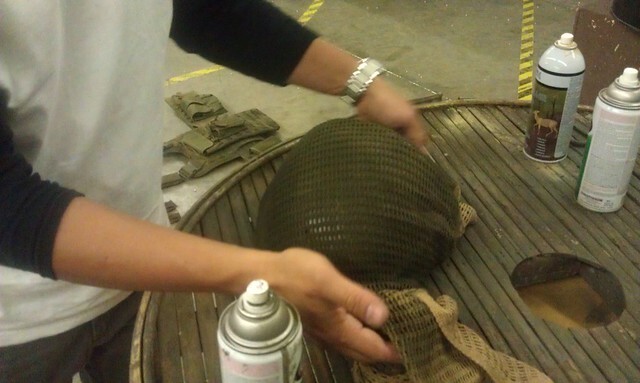 Oh yeah, here's what the can of the glossy tan looks like. I guess it's technically a "satin," rather than labled as "glossy." 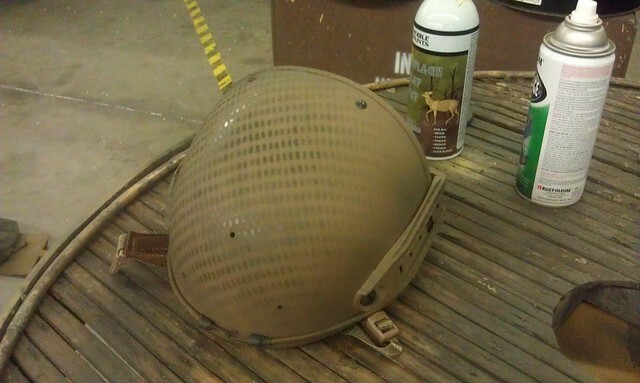 For the helmet, we used more of the glossy/satin tan over the mesh, whereas on the PC, we used more of the black. Now, I'm sure there are some of you that don't like this look, don't agree with the idea of painting your gear, or perhaps don't like ideas at all. That's fine, I'm not saying you HAVE to do this. 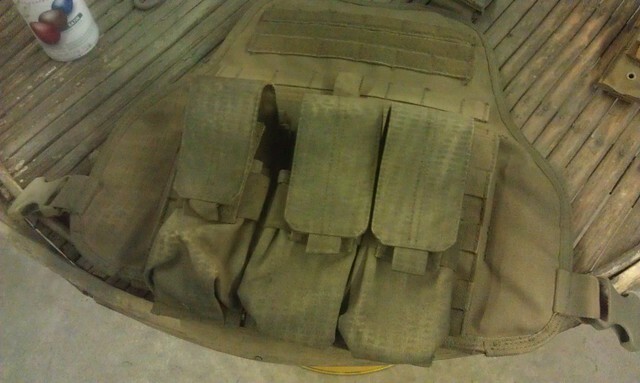 I'm just showing you a way to enhance the appearance of your tactical gear. I'm pretty happy with my decision to do so.